Looking for a family-friendly hotel chain that offers enough room for the whole clan to spread out? Embassy Suites is an all-suite chain that is part of Hilton Worldwide. The first property opened in 1984 as a pioneer in the all-suite concept, and today there are over 225 locations in the United States, Latin America, and the Caribbean. Embassy Suites is a good bet for families because their guest room floorplans feature separate living and sleeping spaces and conveniences such as a wet bar with a microwave and refrigerator. Guests also receive free cooked-to-order breakfast and a nightly complimentary evening reception with appetizers and beverages. Complimentary breakfast each morning, with cooked-to-order eggs, plus help-yourself bar with fruits, cereals, yogurt, more. You can eat in the cafe area or take your food back to your suite if you like. Embassy Suites Orlando Lake Buena Vista Resort - Just minutes from Walt Disney World, this is the only Embassy Suites resort in Orlando. The grounds feature fire pits, tennis courts, a putting green, indoor and outdoor pools, basketball court, beach volleyball court, fishing dock, kids splash pad, dive-in movies and outdoor cabanas with TVs and refrigerators. There's also a fitness center and spa. As always, guests receive a free cooked-to-order breakfast and free wi-fi. 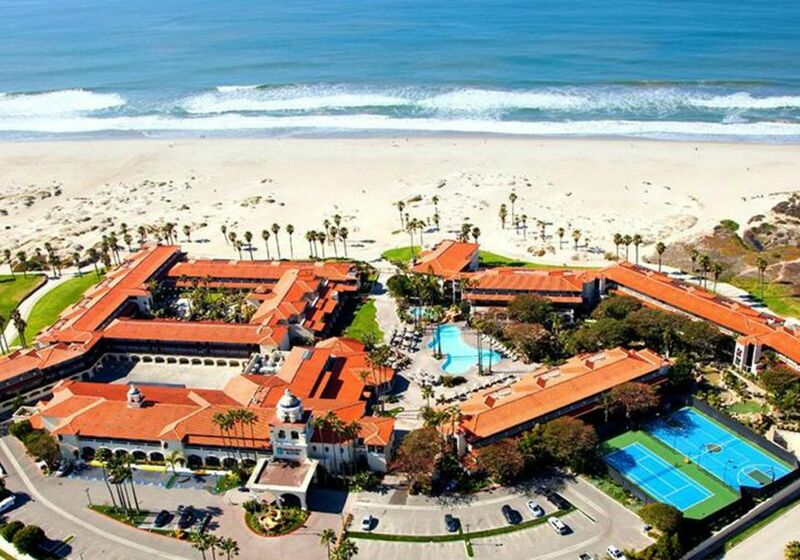 Embassy Suites Mandalay Beach Hotel & Resort - Located between Los Angeles and Santa Barbara near the beautiful Channel Islands Harbor, this is the only Southern California all-suite beachfront resort. All 250 guest rooms feature a private bedroom and a spacious living room, as well as two full marble baths. The grounds are spread across 8.5 acres of oceanfront property in Oxnard and feature a pool with cascading waterfalls, landscaped gardens, and lagoons. Guests can enjoy the complimentary cooked-to-order breakfast, a complimentary evening reception, and free wi-fi. Embassy Suites San Diego Bay Downtown - This hotel offers a convenient base from which to explore San Diego. Families can expect spacious suites, complimentary breakfasts and evening receptions, and frequent special offers. Embassy Suites by Hilton Chicago Magnificent Mile - Located on North Columbus Drive between Navy Pier & Magnificent Mile, the Embassy Suites by Hilton Chicago Magnificent Mile offers renovated suites and features a complimentary breakfast, evening reception, indoor pool, and fitness center. Embassy Suites Myrtle Beach Oceanfront Resort - Nestled on the north end of Myrtle Beach's Grand Strand, this Embassy Suites resort is part of a complex of hotels offering nine swimming pools, a waterpark, spa, and 50,000-square-foot fitness club. Every two-room suite boasts a private balcony and features a separate living room with a sofa bed and a private bedroom. There's also free breakfast and wi-fi. Embassy Suites Dorado del Mar Beach Resort - Located outside of San Juan, Puerto Rico, this Embassy Suites beach resort offers breathtaking views from the 174 spacious two-room suites set along the Atlantic Ocean. All suites feature a sofa bed, refrigerator, microwave, wet bar and two televisions. As always, guests receive complimentary cooked-to-order breakfast and free wi-fi.